Vented crawl spaces all over the United States are suffering with rotting, unhealthy crawl spaces. This has led to millions in home repairs and high energy bill costs. These spaces are the source of expensive, unnecessary home repairs and present a major home energy efficiency issue! By sealing and insulating your crawl space, you'll be able to avoid these problems, while enjoying energy savings, comfort, and a more valuable home. Since we opened our doors to business, our experts have upgraded thousands of crawl spaces across Ohio, including in Cleveland, Akron, Canton, Hudson, Cuyahoga Falls, Ravenna, Bedford, North Royalton, Westlake, North Olmsted, Wooster, Painesville, Alliance, Kent, North Canton, Beachwood, Barberton, Willoughby, Gates Mills, Stow, Brunswick, Massillon, Elyria, Lorain, Strongsville, Lakewood, Chagrin Falls, Medina, and the surrounding areas. To schedule a free crawl space repair quote, contact us by phone or e-mail today! In the winter, the cold air that enters a crawl space will affect your HVAC system, air vents, water heater, and hot water pipes. As they cool, they'll have to work harder than ever, and will cost you unnecessarily large spendings on your utility bills. We can provide you with a wide variety of patented, award-winning products that are made specifically for the crawl space environment. Our experts can upgrade your home's energy efficiency, as well as provide you with professional waterproofing, moisture control, and structural repair services. Our systems can be quickly installed in your home -- with most taking a day or less to install. No matter what you need for your home, we have a warrantied solution that's great for you! Which combination of crawl space products you'll want depends largely on if your crawl space is flooding and how much insulation you'd like to install. If your crawl space is also in need of structural supports, our SmartJack® system is compatible with any of these combinations. We can also provide you with our self-draining Energy-Star-Rated SaniDry™ CX Dehumidifier, or our Turtl Crawl Space Access System-- giving your crawl space that perfect final touch. Ultimate Energy Savings For Your Crawl Space! At Dr. Energy Saver, our experts work with you to create a warrantied system that meets all the goals you've set out to accomplish. Before we leave, we'll provide you with a written crawl space repair quote that lays out your system and shows the cost in black and white. 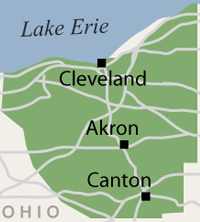 We proudly serve the Ohio area, including Canton, Akron, Cleveland, Elyria, Lorain, Medina, Massillon, Lakewood, Chagrin Falls, Strongsville, Hudson, Cuyahoga Falls, Ravenna, Bedford, North Royalton, Westlake, North Olmsted, Wooster, Painesville, Alliance, Kent, North Canton, Beachwood, Barberton, Willoughby, Gates Mills, Stow, Brunswick, and many surrounding areas. Contact us today to schedule your appointment!